Installation view: Laura Lima "The Inverse" at Institute of Contemporary Art, Miami (ICA). June 3 – October 30, 2016. Courtesy of the Artist and ICA Miami. Photo: Fredrik Nilsen Studio. ICA Miami presents “Laura Lima: The Inverse,” the debut American solo museum exhibition for the renowned Brazilian artist. 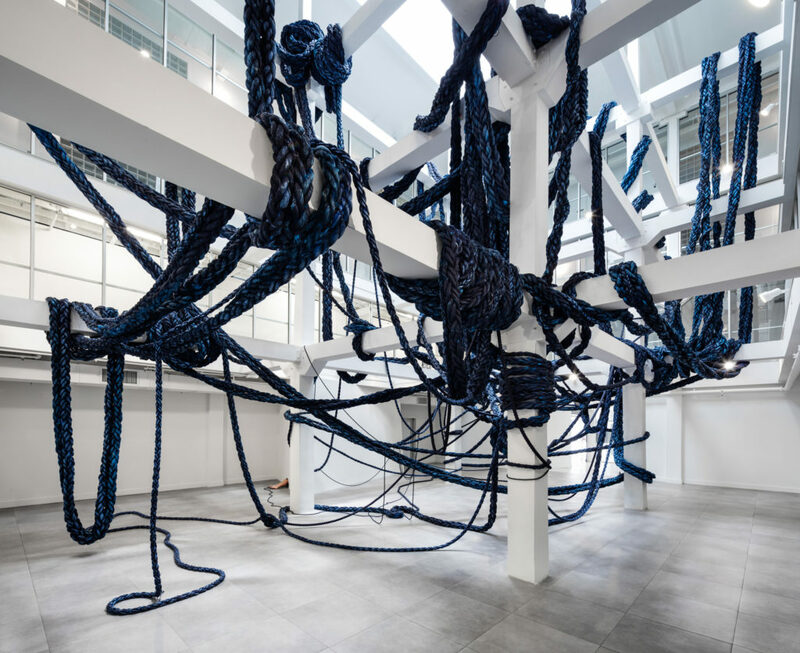 For this monumental site-specific installation, Lima entangles the gridded support beams of the museum’s Atrium Gallery with industrial nylon rope. Enormous at one end, the braided material dwindles in size until it seems to merge with a female body. Set still and partially out of view, the participant’s body achieves uncanny abstraction, presence, and suspense. Working across mediums, Laura Lima (b. 1971, Governador Valadares, Brazil) frequently subjects the body to surprising juxtapositions with objects and architectures. With each installation, Lima consistently reinvents the viewer’s encounter with her work, skillfully considering the nature of perception, social relationships, and human behavior, while creating profound and startling aesthetic experiences. Lima is a co-founder and partner of the Galeria de Artes A Gentil Carioca in downtown Rio de Janeiro with Marcio Botner and Ernesto Neto. She graduated with a degree in Philosophy at the State University of Rio de Janeiro and studied at the Visual Arts School of Parque Lage in Rio de Janeiro. "Laura Lima: The Inverse” is organized by ICA Miami and curated by Alex Gartenfeld, Deputy Director and Chief Curator.